O.K. It is not really a thousand flowers. … But, as soon as I saw this cactus, and got close enough to see that it was flowers all across the crown, I thought, “Holy smokes! That’s a thousand flowers.” … 😉 No, really, I thought that. 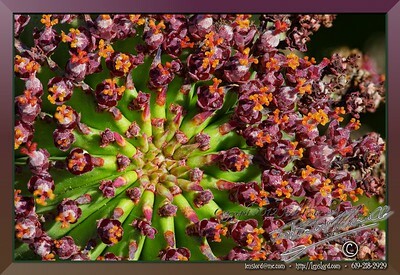 This entry was posted in Flora, Flowers, Macro, Purchasable - As Art Prints, Still Life. Bookmark the permalink. Thanks Steve. We do what we can. 😉 And, I really want to thank you for commenting on my blog.